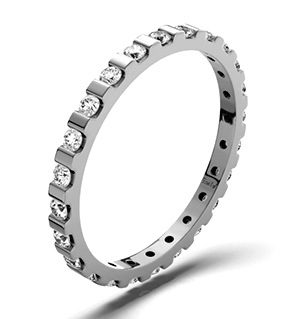 This sophisticated diamond eternity ring features 22 hand selected diamonds, bezel set in a beautifully designed band. Look closely and you ll see all of the diamonds are all round brilliant-cut, despite the illusion. This round and square bezel set ring features diamonds, total weight 0.33ct, in your choice of clarity. Click to see this ring from the side and notice the highly polished design, available in 18k gold or platinum.